For the past 4 days Pebble has been running a countdown on its website. Everyone is expecting the smartwatch maker to announce a new model when the timer runs out tomorrow. Looking at the image which Pebble leaked on its website, I think they're right. 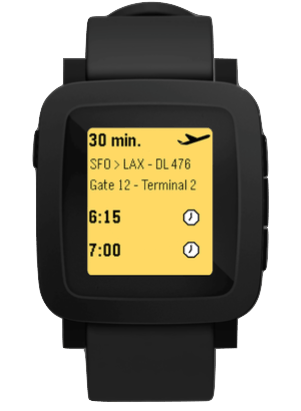 Unless the leaked image is some type of practical joke, the new pebble smartwatch will sport a color screen and be slightly larger than the current gen Pebble. 9to5Mac said that they're expecting the new model to be thinner and have smaller buttons than the current model, as well as a color screen. they're also expecting it to have a Cortex M4 processor, better battery life, and a 6-axis gyroscope. It's not clear what screen tech Pebble will be using. Some sources are describing it as a color epaper display, but I don't know of one which has that particular shade of yellow-orange. I think it's much more likely that Pebble will use some type of LCD screen. The current Pebble wristwatch uses a low-power screen which is grayscale like an E-ink screen. That screen is frequently described as epaper, but is actually a transflective LCD screen developed by Sharp. I think it's likely that the new Pebble will have a similar LCD screen. Japan Display, for example, just announced its third smartwatch screen. That screen was round, and not rectangular like the one above, but it is a reduced-power reflective screen with a low-power mode. It would make sense to use that type of screen in the new Pebble. But we'll have to wait until tomorrow to know for sure.